Readers of this blog will generally lose interest well before the end of the linked Psychology Today article and throw up their hands. They aren't wrong, the article is a great example of the depth of the difference in world view that we face in BOistan, but I soldiered on. One of our giant problems is the loss of philosophy and the attempt to replace it with psuedoscience. Science about creating hypotheiss and MEASUREING results. If it can't be measured, it isn't science. Science can't recognize human consciousness, love, empathy or beauty because they can't be measured. The "soft sciences" like Psychology, Political Science, Anthropology, etc use statistics which is a branch of mathametics, a TOOL of science (which is also a tool) to give itself the patina of "scientific authority". Scienfic authority itself is a complicated subject -- "works as designed so far with no promises for the future" is the authority. Much like the turkey two days before Thanksgiving giving a 99.999% statistical confidence interval to the assertion that "humans are benevolent creatures that care for turkeys", sometimes there can be surprises in the future. The purpose of the article is really accomplished in the headline "right bad/childish/foolish/etc", left good/adult/smart/.etc" ... "proven by science"! So lots of ink is wasted on "empathy", "still faces" (uncaring people), family stress, inequality, etc until we get to this fine paragraph. The right-wing media machine, one that has reached its zenith in the Trump campaign, has stoked the fires of the scapegoating reflex that always seems to lie just beneath the surface of the psyches of victimized whites. Thus, it’s important to pause and recognize that the propagandistic xenophobia of the Right has helped propagate the deep story that Hochschild so empathetically tells. The "deep story" is that the middle class feels like the US economy isn't moving and that minorities and even "environmental concerns" are "cutting in line" ahead of them. As the above paragraph indicates, they have been "manipulated". The following paragraph lets us know that Robin Hood, Jesse Jackson and Bernie Sanders have the answer, one must "take from the greedah and give to the needah". Wilkinson and Pickett’s research on the harmful effects of economic inequality should force us to make redistribution the centerpiece of our political program, just as it was for Bernie Sanders. Their research clearly shows us that greater equality itself can ameliorate a wide range of suffering. And the fact that our society disconnects us from each other means that we have to seek common ground with the people on the other side of what Hochschild calls the “empathy wall” and communicate to them that we not only feel their pain, but share it, and that, in the end, we are all in this together. This sort of writing is not all that interested in much in the way of "facts" (to the extent that such things exist anymore outside the domain of the hard sciences). Income inequality has been going up since the early '80s no matter which political party was in power. The following chart from here. Our eyes are of course drawn to the red top line, and the headlines admonish us to look there. Let's just not be manipulated for a moment and consider if how Stephan Curry or Lebron James play basketball has much to do with the rest of us. Look at the blue, tan, and yellow lines. First, they are NOT correlated with the red! The fortunes of the 1% rose and fell with primarily the stock market. Were we to look at the blue, we would likely find that stocks were also a component of their fortunes. THE BIG NEWS looking at this chart ought to be that Trump and his primary supporters are RIGHT! Whatever policies have been initiated and maintained since '80 have resulted in middle 60% and the bottom 20% having nearly identical economic results for the past 35 years! Is that what we want to see? 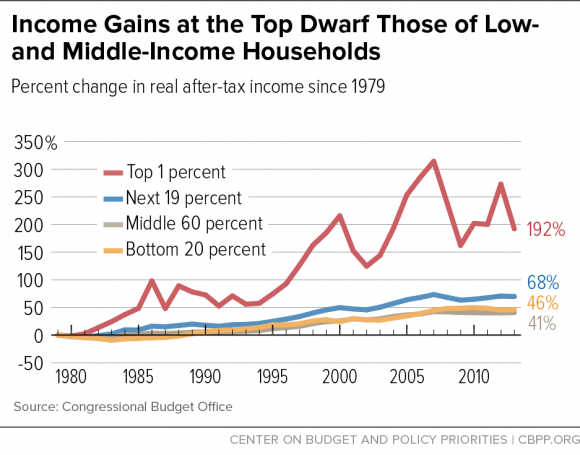 Why do we NOT want to see the bottom 20% stay at inflation adjusted flat income? Would we not rather see the 60% grow a little more showing some incentive for work? My purpose here is not to go into economic policy, but to point out what I see on a regular basis by exposing myself to the MSM. "science" is regularly trotted out to support left wing ideas without so much as a tiny shred of factual data being shown. the left constantly tells themselves that "the 1%" and the "right wing" are the problem, which factual data shows to be completely wrong. The 1% is pretty much disconnected from the rest of the population -- they are CEOs, financiers, movie stars, sports heros, the Clintons, etc ... their lives are not the lives of the other 99%, nor will they ever be. Here, in North Korea, China, Cuba, or anywhere. Most of the trends of the last 35+ years continue through all types of poltical administration. Technology may be driving them. Poltical decisions made prior to 1980 might be driving them (mass immigration, FICA, Medicare, welfare, etc), or something we are not seeing -- but the answer really doesn't appear to be either the 1% or the right wing. Previous bullet notwithstanding, the left wing position of "the 1% and the right wing" is loud and CONSTANT. The MSM and "The Party" (TP-D) certainly at least seems to believe it fervently. For many on the left, this belief is as strong as any religious belief held in any world religion, because it IS a religious belief in Secular Humanism.